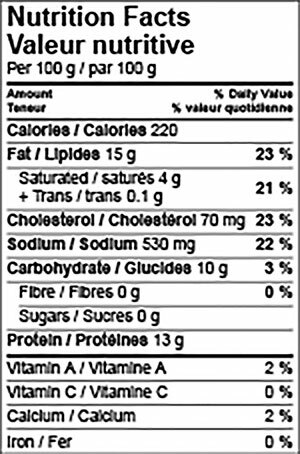 Chicken Wings (Winglets, Drumettes), Water, Rice Starch, Salt, Spice Extracts, Canola Oil. Thaw unopened plum sauce packets in hot tap water while chicken is cooking. Preheat oven, with steam, to 185ºC (360ºF). Place frozen wings on a baking tray. From thaw, coat with flour or breading and deep fry at 175ºC (350°F) for 4-6 minutes or until hot. Time may vary with fryer and coating. Heat to an internal temperature of 74°C (165°F). Deep fry from frozen at 175ºC (350°F) for 6-8 minutes or until hot.